Robinho one of the best and current striker in Brazil football team. The full name of Robinho is Robson de Souza. Robinho was born in the year 1984 January 25 at Sao Vicente, Brazil. The skills, ball control and tackling ability make Robinho different from other players. Robinho played his first club football for Santos in Brazil in the year 2002 when he was only eighteen years. After finishing the contract with Santos, Robinho joined Real Madrid with jersey number 10 from Luis Figo. Robinho scored 14 goals in his first season for Real Madrid. In 2008, Robinho moved to Manchester city. On August 2010, Robinho transferred from Manchester city to AC Milan for £15 million with a 4 year contract. Robinho scored his first goal for AC Milan in October 2010 against Chievo club. Robhinho's International career began in 2003 CONCACAF Gold Cup, then in 2005 he was a member of 2005 FIFA Confederations Cup. His brilliant form continued in Copa America 2007 as he scored a hat-trick in the tournament. His last biggest tournament is 2010 FIFA world cup and scored 2 goals in the tournament. Robinho was married to Vivian Guglielmetti and had two sons named Robson Jr and Gianluca. More details about the profile and career statistics of Robhinho are given below. Robinho started his club career from the year 2002 for Santos. He scored 10 goals in 2002, 9 goals in 2003, 21 goals in 2004 and 6 goals in 2005 and ends the contract with Santos. Then he joined Real Madrid from 2005 to 2009 and scored total goals of 25 for Real Madrid. 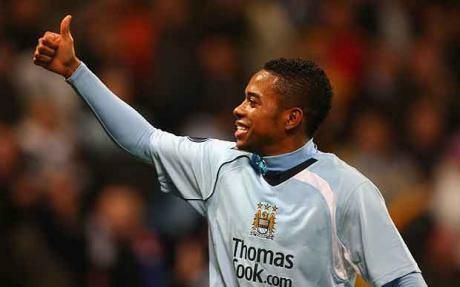 From 2008 to 2010 Robinho gets transferred to Manchester City and scored 14 goals. In 2010 He come back to Santos but only played 2 matches and finally and currently he was playing for AC Milan and scored a total of 16 goals.